The USA should legislate English as the official language of government at the federal, state, and local levels - for the government to act officially, it must communicate in English. With the language of record as English, no one would have the right to demand government services in any other language. I first considered supporting this movement several decades ago, when the City of Dallas printed everything - ballots, initiatives, instructions, etc. - in English and Spanish. I wondered - what will we do when the Vietnamese community demands voting ballots be printed in Vietnamese. And then another ethnic group. How could we say no to one group but yes to others? It could get to be very expensive and discourage immigrants from learning or practicing English which would be to their detriment as they tried to find work, seek promotions, and conduct daily business. Official government documents (billions of pages of them) must be printed in 2 (or more) languages. This requires more paper, more document translators, more production, etc. All paid for by taxpayers. This also includes signs in government offices, training classes, and all other functions of government. Lots of money spent with not much benefit. As other languages are added to the list, the costs will go up and the benefits will decrease. The United Nations determined that air traffic controllers must learn and use only the English language. So all could be communicating in one system. A brilliant idea, and one that now seems obvious - of course, all these people should be communicating in one language. What about emergency personnel - ambulance drivers, paramedics, fire fighters and police officers? They need to be able to communicate immediately to suspects, citizens, bystanders, injured, etc. How could they possibly learn enough languages to do that effectively if there was no official language. Learning to speak English empowers immigrants. By more than 2-1 immigrants themselves say the US should expect new immigrants to learn English and by a 9-1 margin Hispanic immigrants believe learning English is essential to succeed in the US. An official language does not inhibit individual cultural heritage. Any citizen can speak their ethnic language at home, in the community, and in stores and markets. According to James Crawford, language diversity has always been with us. As early as 1664, when the island of Manhattan was ceded from the Dutch to the British, 18 different tongues were spoken there, not counting the hundreds of Native American languages spoken in North America at the time. There are more languages spoken in the USA today; the 1990 census reported 323. Official English would reinforce America's historic message to new immigrants - that they are expected to learn English as the first step in their assimilation - and that all Americans share in the economic, social and political benefits of having a common language. 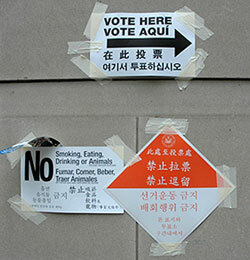 30 states have enacted laws making English their official language, often with vote margins as high as 9-1. None of these states prohibit government agencies from using another language when there is a compelling public interest for doing so. These include: protecting public health, promoting tourism, teaching foreign languages, providing for national defense, and many other legitimate, common sense needs. Official English doesn't mean 'English only'. From The Oklahoman, March, 2009. Rep. Randy Terrill said more than 30 states have already approved official English laws. "As our common American language, English and the ‘melting pot' process it supports has made the United States the most successful multi-ethnic nation in history," said Terrill, R-Moore. "Unfortunately, the drive to linguistically Balkanize our nation makes it harder for legal immigrants to assimilate while wasting limited taxpayer dollars." Terrill said movements to promote multiculturalism and recent immigrants who have not learned the English language are destroying America's "linguistic unity." "The demand to accommodate other languages has gotten out of hand," the lawmaker said. Under the provisions of the legislation, people in private conversations and businesses still will be allowed to use whatever language they choose. Only government activities would be affected. The bill also contains exemptions for the languages of Oklahoma's 39 federally recognized tribes and allows use of both Braille and sign language in government services. The legislation also contains a number of other specific, narrowly tailored exceptions for things such as public health and safety, as well as trade, commerce and tourism. Terrill said the bill would prevent the state from being compelled to provide taxpayer-funded services in any language other than English. The state has spent about $22,000 to print Spanish-language driver's license manuals and has paid nearly $7,000 for translation services, Terrill said. That could increase as more than 20 people last year requested tests in other languages, such as Arabic and Russian.